There is something special about knitting, about that which comes from the heart. When someone else knits for you or you knit for others, that project becomes an act of love. That love can be seen, touched and felt in a simple sock monkey vessel, even in a simple loving dishcloth. Selene, Sock Monkey of Moonlight is that act of love and comfort for my youngest niece, Elizabeth. Elizabeth is the youngest of three children and a sweet darling who always made me laugh. She’s moved to Florida now, and I cherish her in my heart as I do her brother and sister. But each child brings you a different joy. Elizabeth’s is the gift of humor. She never fails to delight me with funny faces or by curling her tongue at me when we wake up and I’m not certain I’m ready to face that day. That humor gave me the courage to get through some difficult times, and she was only three then. She was likely unable to fully comprehend her effect on me simply by being who she is. 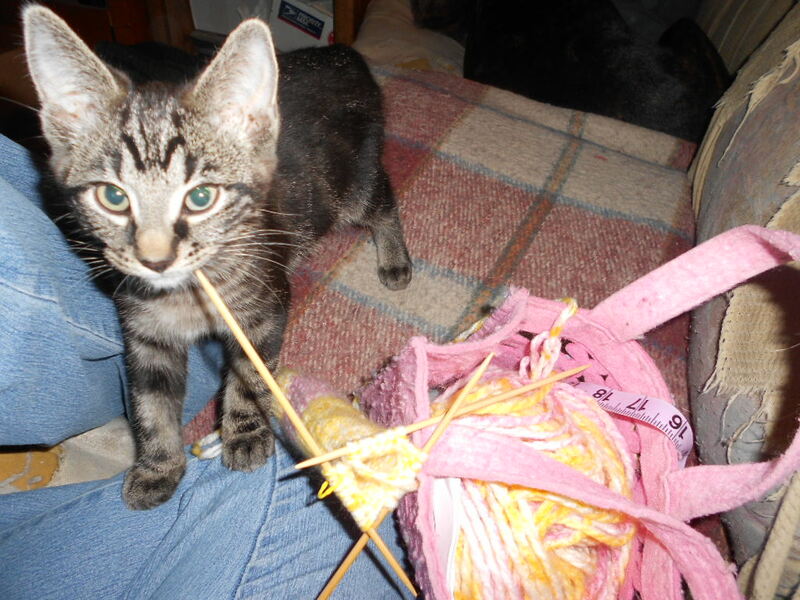 The hope, by knitting Selene for her, is that she will feel me thinking of her as I knit. That she will feel the love and happiness she brings to me as she enjoys her sock monkey and hosts tea parties to honor them, fancy hats often required. After all, Selene did arrive with a purple, green, and blue hat of Spring to match Celeste’s fur and Celeste has the yellow and pink hat to match Selene’s fur. They have been gifted to sisters after all. Now, I shall get to some of the mechanics of the knitting love into stitches. Some think its just yarn. Some think its the same yarn. But as I mentioned last week, each monkey has their own personality. Just as a roomful of small children will be filled with many personalities. I found this Cotton Candy yarn by Deborah Norville to be less striped than the Spring color. 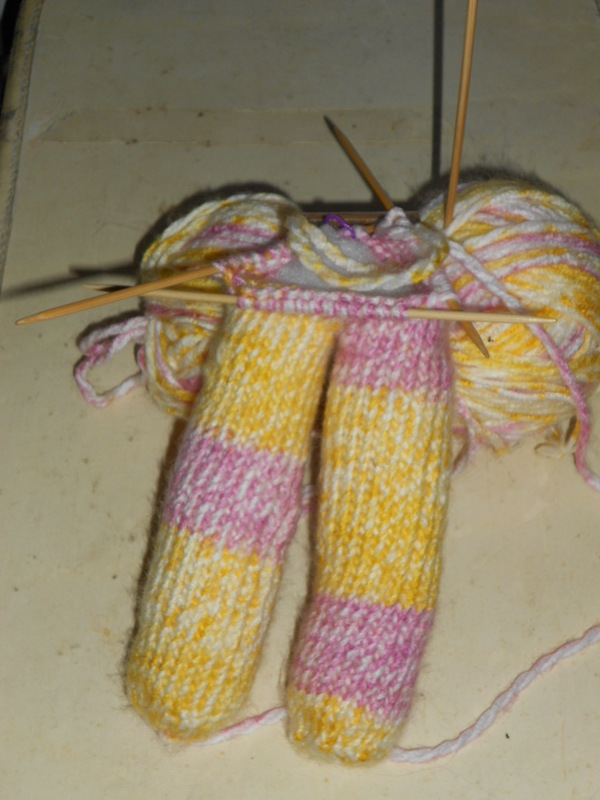 I watched it knit into a 2:1 ratio of yellow to pink(2 inches of yellow for each 1 inch of pink). I was hoping for more of a 1:1 ratio. However, I did have some striping on each appendage as you will see from the photos. Some may ask if it becomes rote to knit the same project more than once. It might, but I have yet to find that. With each monkey, I have been lucky enough to change the yarn color and sometimes the texture of the yarn. Each yarn often has a slightly different feel in your fingers. Each color has a different look. Most acrylics feel like acrylic but the single strand is thinner than most double strands, and Caron Simply Soft is usually softer than Red Heart Yarn. The Sensations Angel Hair was more fuzzy, and the Vanna’s Choice in barley which I used on most of the monkeys felt the closest to wool I’ve noticed. I’ve found that liking the yarn helps me to want to do the project. 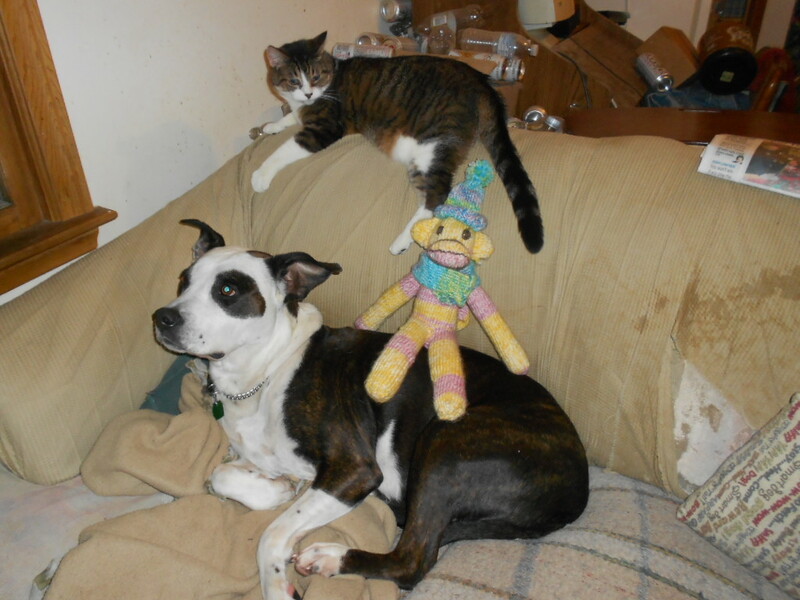 But the sock monkey is relatively simple to knit, yet has enough parts and complications to keep me occupied. Shaping the rear and the muzzle take a more concentration of effort and should not be attempted when one is asked to naviagate through unfamiliar roads. The ears knit up quick and take on a cuteness of their own as well. And while one ear is usually covered by the hat, I knit both ears and sew them on. Part of the reason for this is that while I work to secure the hat to the head and the scarf to the neck, I find children often want the option to remove these items. Therefore, I do not knot them. Most people I’ve provided these monkeys to have enough sense to secure the hat and scarf back on in a hidden manner if they feel the need to do so. Or they know enough to find someone who can. As for the monkeys themselves, they have one or two jobs in this world, but they’re the biggest jobs of all. Their main job is to share the love I felt for my nieces and friends as I knit these monkeys for them. Their secondary job is to listen to the child when they need it, to help them feel loved no matter how tough life seems. After all, there’s a certain strength in knit stitches that hold what little else can. I hope they bring love, comfort and happiness to their recipients.